Made by Unknown (person) in England, c.1860. In the 1850s thousands of immigrants arrived to seek their fortunes on the Australian goldfields. Hoping to find wealth, most unearthed only hardship and disappointment. Nevertheless the discovery of gold inspired tales of adventure in children’s fiction and non-fiction. It also inspired board games illustrating life on the gold fields. Around this time the game called ‘Race to the gold diggings of Australia’ was produced in England. 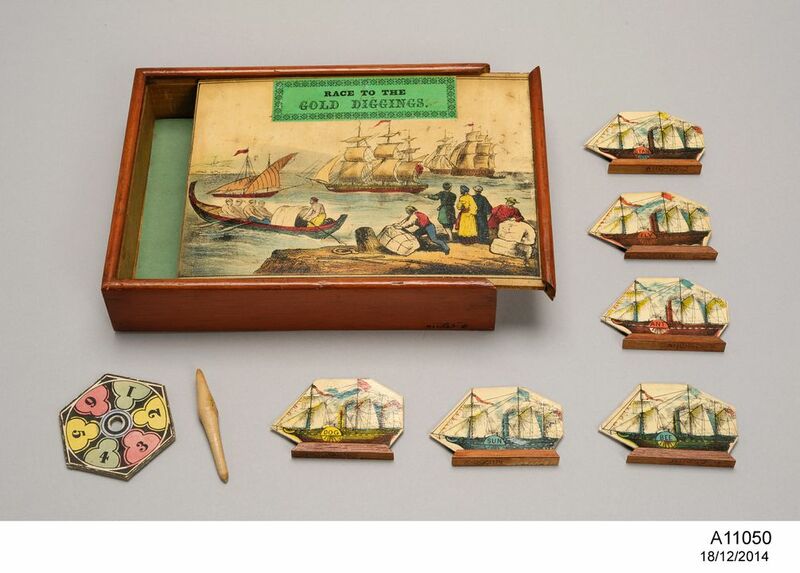 Board game, 'Race to the gold diggings of Australia', linen / wood / paper, maker unknown, England, 1850-1869. A boxed children's board game. The game board consists of a hand-coloured lithograph mounted on linen, accompanied with a printed rule card, 6 painted ship pieces with stands, and a cardboard teetotum, all contained in its original wooden case with illustrated lid. The illustration on the game board is a oval track divided into 80 sections, simulating the journey by sea from England to Australia; the central illustration depicts miners at the gold fields, while in each corner of the game are vignette illustrations showing travels, success on the diggings and bags of gold. The illustration on the box lid shows ships "Passing the Cape of Good Hope". The maker of the board game is unknown.